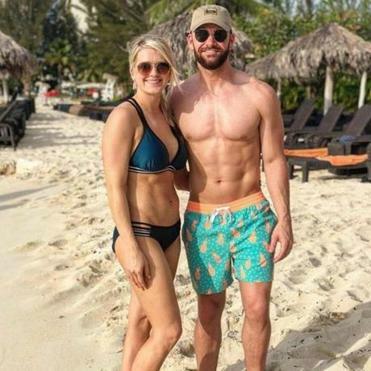 Dylan Scott with his wife, Blair Robinson, in Jamaica. Country singer Dylan Scott is bringing his 2019 “Nothing to Do Town” Tour to the Paradise Rock Club on Jan. 18. Scott, 28, performed in Boston last summer and said he is looking forward to his return. “The energy the crowd brought was great and I know that this time it is going to be even greater,” Scott said in a recent phone interview. “I’m ready for their energy and for a great night.” The Bastrop, La., native, whose 2018 single “Hooked” climbed the country music charts and new single, “Nothing to Do Town” is debuting this week, lives in Nashville with his wife, Blair Robinson, their 1-year-old son, Beckett, and their two German shorthaired pointers, Brodie and Bella. We caught up with Scott to talk about all things travel. Favorite vacation destination? Anyplace that has sand, a beach, and an ocean. I love the beach scene with the smell of saltwater and the bright blue skies. That is my ideal vacation. Favorite food or drink while vacationing? Any kind of seafood — lobster, crab legs, shrimp . . . you name it. I don’t get much seafood in Nashville or when I am on the road, so I look for it when I’m on vacation. Where would you like to travel to but haven’t? I have been wanting to go to Hawaii for a long time but just haven’t taken the time to yet. However, I plan on it as soon as my schedule allows. One item you can’t leave home without when traveling? I can’t leave home without my gym bag. I work out religiously on the road and could not survive without it. Aisle or window? Definitely window because I use it as a head rest to sleep. With all the early-morning flights and redeyes I take, that is the only way I can catch some z’s when flying. Favorite childhood travel memory? Going down to the beach in Panama City, Fla. It was an annual ritual that I still try to do every year with my extended family. There were no beaches in northeast Louisiana, so going to the beach with my family — my parents and three siblings, and my aunts, uncles, cousins — was always a good time. We’d rent a condo on the water, play Frisbee and football on the beach, go out to dinner. . . . Great memories. Guilty pleasure when traveling? I usually don’t have candy around the house, but the first truck stop we come to, I have to get off the bus and get my supply of Laffy Taffy. Strawberry, cherry, and blue raspberry are probably my favorite flavors. Best travel tip? Lay down $80 and get five years of TSA Pre-approval for flights. It allows me to get to the airport closer to departure and I don’t have to get halfway undressed to go through security.